Home » A Laundry Service: Do You Really Need It? A Laundry Service: Do You Really Need It? 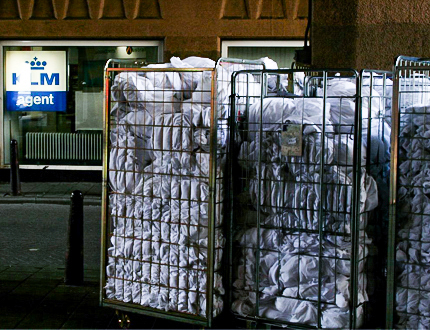 Letting a laundry service take care of all your laundry-related work and accommodation linens can be extremely helpful. Having to do your laundry yourself would probably take a lot of your time, which would prevent you from focusing on other, more important things. If you work from home, hiring a laundry service would allow you to take care of your other housework at your own pace without having to run around and constantly check your washing machine and dryer. You could take your time knowing that there is one less thing to worry about. If you work in a hotel, using a laundry service would allow you to relax since you wouldn’t have to run from one room to another and think about putting another load in the washing machine. With all that in mind, here are just some of the advantages and disadvantages of hiring a laundry service, which will hopefully help you decide whether you really need it or not. Of course, there may be some disadvantages of paying somebody else to do your work for you, but those disadvantages become much less significant if you take into consideration the convenience of paying for such service. Hiring a laundry service means that your employees will no longer feel stressed out over the amount of work they have. Also, taking care of the whole linen process will be much easier since they won’t have to think about the cleaning process as well. This will help them feel much more in control of their work. For example, if a hotel is using a laundry service, it means that the housekeeping employees don’t have to constantly change and clean dirty linen and toiletries. This will allow them to focus on other aspects of their work since all they need to do is send the dirty laundry away and receive them fresh and clean. This way, their workflow will remain undisturbed and they won’t feel so frustrated over the amount of work they have. Time is always important, especially in the world of business. There are always strict deadlines for housekeeping employees, which serve to ensure that the hotels guest have their room as soon as possible – and that they are satisfied with it. So, if an employee has to spend time dealing with dirty laundry, then they can’t focus on cleaning the rooms thoroughly and on time. This is just one of the issues that using a laundry service can solve, as it allows employees to spend more time taking care of the rooms so their guests can truly enjoy their stay. If you were to do all your cleaning yourself, you would also have to spend money on all the cleaning products you would need, and some of them can be quite expensive. On the other hand, laundry services mostly buy these kinds of products in a bulk, which means that they are much more affordable for them. From that point of view, it’s clear why it’s better to let laundry services take care of your cleaning needs instead of doing everything yourself. Lately, there’s been a lot of emphasis on going green, and lots of companies take pride in being considered eco-friendly. However, the thing is, going green can be rather costly as some equipment required for such a thing is not exactly cheap. In other words, if you’re running a small business, you might not be able to afford the equipment you would need for going green. On the other hand, laundry services are all about customer satisfaction, so when it comes to laundry, they use only the best machinery. So, using a laundry service is definitely something you should consider if you want to implement an eco-friendly aspect into your business. Just like everything else, hiring a laundry service can sometimes be quite expensive. In most hotels, linens are changed every day (depending on whether somebody’s been using the room recently) so the amount of linens that need to be cleaned can really accumulate. Since you won’t be the one dealing with your laundry, you can’t really know anything about the process it will go through at the laundry service or the cleaning products they will use. Even though most laundry services make sure to use safe products, there is still no way for you to know what exactly they are using when taking care of your laundry. The services are usually standardised, so every linen will be treated the same way. This means that if you have high-quality linen at your hotel, it might be a good idea to get informed about the best methods for washing sensitive linen and whether your laundry service can use such methods. In other words, you might need to make some special requests when it comes to the way your linens are washed at the service. Luckily, many laundry services are willing to cater to all of their customers’ needs, just make sure to actually make such a request if you don’t want your linen to be treated like any other. So, Do You Actually Need It? If you simply have too much linen to take care of yourself, don’t hesitate to hire a laundry service that will make your work much easier. As your business grows, there will be more and more work, so letting another company take some load off your back will definitely help you keep everything under control. In short, although there are some disadvantages to hiring a laundry service, there are many more advantages that would make such a decision pay off in the long run. By outsourcing your laundry cleaning needs, you’ll be able to boost the productivity at your workplace, help your employees feel less stressed out, minimise your carbon footprint and save some money. Need fresh, clean and quality linens every day? Alsco offers a comprehensive range of linen to suit your needs. Contact us now.